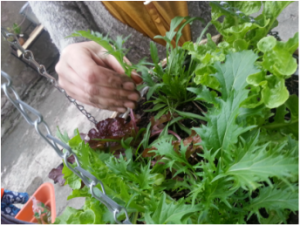 Leith Community Crops in Pots’ main aim is to encourage and support the people and organisations of Leith to grow vegetables (and fruit), and flowers for pollinating insects, to improve community cohesion and the environment. They work in three primary schools, a secondary school, a nursery and a family centre. In 2013 Edinburgh City Council appointed Leith Community Crops in Pots to manage two acres of wasteland at the north-west corner of Leith Links. They have developed the area into a communal growing space – ‘Leith Community Croft’ – and encourage a range of ages and abilities to learn about growing. They currently have nearly 100 members. Because the Croft is on common good land it will always be open to everyone, and they encourage locals to visit and get involved. The importance of green space in cities cannot be underestimated; communal outdoor areas boost wellbeing and community cohesion, as Greenspace Scotland have shown. Further community cohesion is fostered through the events they hold, such as the annual Harvest Festival in St James Episcopal Church. Many of these run in collaboration with other organisations, for example the Himalayan Centre for Arts and Culture, the Scottish Storytelling Centre and Edinburgh & Midlothian Beekeepers’ Association. This year Leith Community Crops in Pots have grown over half a tonne of food so far, saving nearly a tonne of carbon dioxide-equivalent greenhouse gas, and more remains to be harvested. As well as encouraging people to reduce their carbon footprint by growing locally, they have a broader educational focus. Their community education officers not only run programmes in local schools, teaching kids where their food comes from and how to grow it themselves, but they also run a family-friendly, hands-on sustainable food course called Leith Lunches, discussing how we can cut down on food waste and make more sustainable food choices, amongst other things. Feedback suggests that people find this both interesting and enjoyable. Please see the website for further information on all projects and how to get involved: http://cropsinpots.org.